Sergio Daher was born in Fortaleza-Brazil on the 3rd of August 1971; son of Elias Daher and Josephina Sophia Lira Daher. Since young, he showed interest in sciences and latter he gave special attention to the electrical and electronic engineering areas, what remains until today. His main areas of interest are: Power Electronics, Renewable Energy Systems, Electronic Instrumentation and Control Systems. He believes that is possible to make the world better: all together, starting now, within our life context, doing small daily contributions. 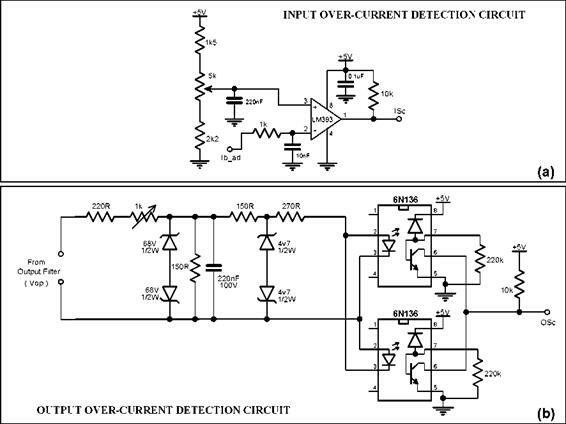 The implemented prototype is protected against over-current conditions at its input and output by using the circuits shown in figures (a) and (b), respectively. The input protection circuit makes use of the battery current sensor. It simply compares the sensor output with an adjustable voltage reference and generates a pulse that is applied to both main and auxiliary microcontrollers. It should be noted that this circuit only detects an over-current in one direction (in this case, from the battery to the converter). In : current thought the nth output stage switch. Note that transformer secondary currents are equal to the correspondent series-switch current (odd switch). ■ The implemented controller does not take into account that the inverter output voltage can present a DC-level if the inverter feeds unsymmetrical loads, such as half-wave loads. Future implementations must include a mechanism to monitor and eliminate any possible output voltage DC-level. ■ The implemented controller adjusts the output voltage amplitude by only changing the number of output levels. Future implementations might include fine adjustment of the output voltage amplitude by also altering the output voltage waveform shape. ■ In this work, the correction of transformer-unbalancing was investigated only at steady-state level. Future work might study the transformer dynamics and should consider it on the controller design. This dissertation had investigated a high efficiency multilevel inverter topology which has great potential for application in stand-alone renewable energy systems. The presented study was focused on small systems (< 10 kWp) and it was showed that most typical system configurations store energy in battery banks in order to overcome the intermittence and peak power limitation of renewable energy sources. In this context, it was also identified that these systems require inverters with improved characteristics of reliability, capability to start heavy loads, efficiency and robustness. In fact, all these benefits can be achieved through the use of multilevel topologies.